Deputy Prime Minister Bekir Bozdağ said Monday that despite contradicting reports, Turkey had given no guarantee to Russia, or any other country for that matter, that Operation Olive Branch will only be confined to Syria's Afrin. Speaking to reporters following a cabinet meeting, Bozdağ, also said nobody had the right to impose limits on its operation against the YPG. He added that no Turkish soldiers had been killed or wounded in the operation so far. 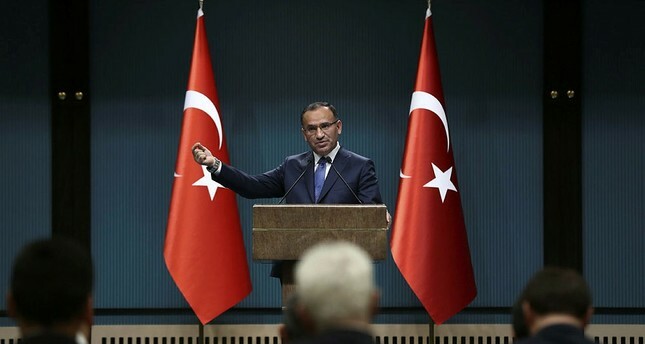 Despite no guarantee, Bozdağ underlined that the operation's main objective was to cleanse every terrorist threat from the region and its only target was the PKK's Syrian affiliate the YPG and the Daesh terror group. Foreign Minister Mevlüt Çavuşoğlu also said last week that after Afrin has been cleared of terrorists, Turkey will expand its operations to other critical areas. "Turkey's measures against the YPG/PKK cannot be limited to Afrin alone. There is also Manbij and east of the Euphrates River," Çavuşoğlu told reporters in Vancouver, Canada. In the wake of international concern, the minister assured that the operation was continuing successfully as planned. He also pointed out that it was "very important" for the international community to support Turkey's operation against terrorists in Afrin. In response to U.S. Secretary of State Rex Tillerson's comments about possible cooperation between the U.S. and Turkey to create a "security zone" in northwestern Syria, Bozdağ asserted that for such cooperation to take place the US must first stop supporting the YPG and recollect the weapons it provided to the group. Operation Olive Branch was launched on Saturday, targeting the PKK terror group's Syrian affiliates the Democratic Union Party (PYD) and its armed wing People's Protection Units (YPG) as well as the remaining Daesh elements in Afrin region on the Turkish-Syrian border. While ground troops located in Kilis province near the Syrian border aim at PKK/YPG targets with howitzers, tank units, multiple rocket launchers, Turkish warplanes target previously identified terrorists in an air operation.